Tagged under Marvel, Series, Non-Anime. More than 50 years old and spanning multiple serializations, animated TV shows, motion pictures, and numerous other related merchandise under various names, this is the story where mutant kind and humanity are pitted against each other in a battle across time and space. The franchise focuses mostly on the team dubbed the "X-men" and their struggles with their own powers, their fellow mutants, and the humans who want to eradicate them. 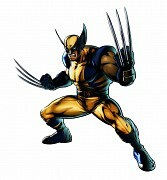 Among the franchise's most recognizable characters are Professor X, Magneto, Wolverine, Jean Grey, Cyclops, and Storm.